Why don't our governmentally approved dietary guidelines line up with proper human nutrition? 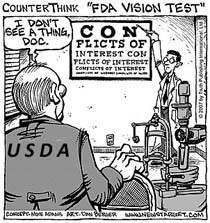 A conspiracy theorist would say that industry lobbyists run the tests that get unsafe food additives approved and that their employees go to work for the USDA to make sure that their interests are served. I think that there's a lot to be learned by following the money trail, but I also think that there's more to the problem. Part of the issue is that proper human nutrition is a very complex subject. So many of the simple "facts" that I learned about human nutrition in school don't hold up to the light of sound science. Don't eat fat or you'll get fat. Don't eat cholesterol or you'll have high cholesterol. Unfortunately, our bodies aren't so cut and dried. Good nutrition is all about balance. Let's look at osteoporosis, which common wisdom says is caused by not eating enough calcium to keep our bones strong. 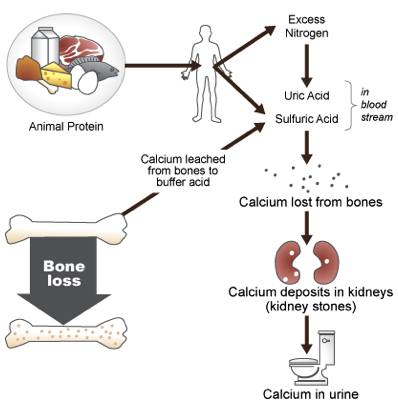 In reality, a handful of factors all play into whether that calcium makes it into your bones, and a deficiency of essential fatty acids, zinc, copper, boron, manganese, silicon, vitamin K, magnesium, or potassium can all rob calcium from your bones. So can eating too much animal protein, pasta, beans, nuts (except almonds), and unsprouted grains since these foods all make your blood acidic. To counteract acidic blood, your body yanks calcium out of your bones --- hello, osteoporosis. You can also get osteoporosis by consuming too much vitamin A without also increasing your dose of vitamin D. The dairy industry would have you believe that drinking their vitamin A and D fortified milk will keep your bones strong, but the artificial vitamin D in milk isn't used in the right way by your body, so you might actually be doing more harm than good by chugging that white fluid. I guess the leafy green and broccoli industries didn't have enough cash to outcompete the dairy industry when it came time to tell the American public how to get calcium in our diets. The upshot is that we need to think a little harder about nutritional guidelines we thought we understood. We should check to see if there's a conflict of interest involved in the recommendation and we should delve a bit deeper into the science. Luckily, Michael Barbee did the legwork for us with Politically Incorrect Nutrition. Break free of the cubicle with our $2 ebook. I have corn allergies, so can't drink fortified milk. When I called an organic farmer to ask about their milk, I learned the interesting fact that the two reasons they fortify milk is 1)the current grain based diet (instead of grass) of many cows makes them have less nutritious milk. 2) making low fat milk removes most of the natural vitamin D found in milk. So organic whole milk does not need and often does not have vitamin fortification. That's exactly what I've been coming to understand. One of these days, I'm going to trick someone nearby into taking care of a cow for me so that I can have real dairy!